This entry was posted on January 8, 2016 by Jessica Anderson. 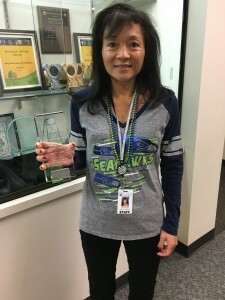 Sue Maybee accepts the 2015 Customer of the Year Award for the Issaquah School District. Each year we choose one customer to honor as our 'Customer Of The Year'. However this year we are honoring a group of very special customers at an organization we love. The Trophies2Go 2015 'Customer of the Year' is the Issaquah School District. ISD was nominated by our engraver, Paul, and at our annual holiday party in December, our staff unanimously voted to honor the district. Each year the Issaquah School District celebrates student, athletes, teachers, staff and volunteers with meaningful recognition for their recipients. We make name badges for district employees and ribbons for the Issaquah Schools Foundation annual luncheon. When the district celebrates their retirees, we create engraved clocks for their ceremonies. At the Issaquah middle and high schools, coaches and teachers often order plaques and trophies for athletics and scholarship winners. Each May we create awards for the music programs at the middle and high schools. We love to help elementary school PTAs with Reflections ribbons, Science Fair awards, and Golden Acorn Plaques. And there's many more orders that the school district brings our way. Not only is the Issaquah School District an important customer, but it is also extremely important to our families. 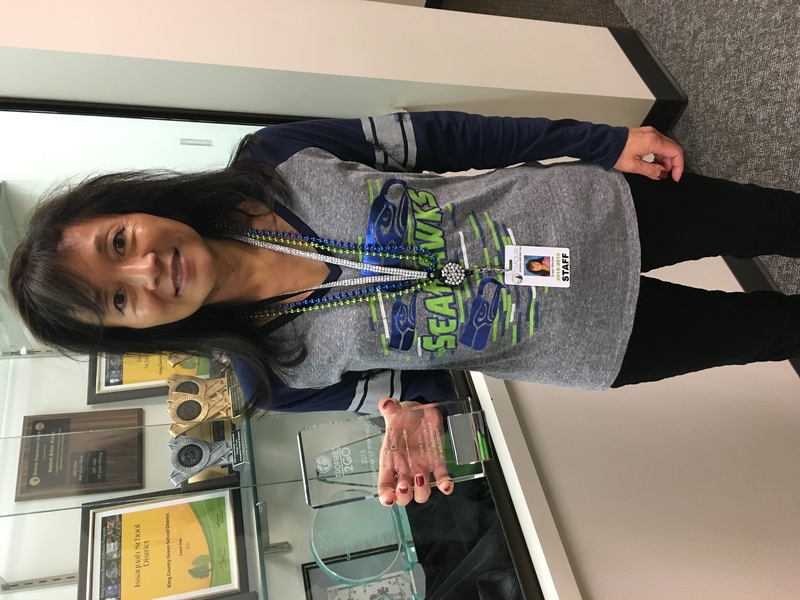 Many of our employees either have children who have attended Issaquah schools (Janice, Mika, Jessica and Mike) or even graduated from the district themselves (Jeff and Laurie). Both of my daughters attend Issaquah Schools and their education is top-notch. We are honored to help celebrate achievements in the Issaquah, Sammamish, Bellevue and Renton communities through our award-winning public schools. 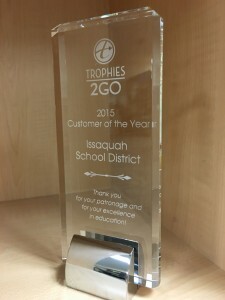 Thank you Issaquah School District for being an awesome customer and for doing a fantastic job of educating our community's children!